The Sony Xperia Z Ultra has an 8 MP camera that's good for up to 3264 x 2448 pixels pictures in Normal mode, however if you use the Superior auto mode you get stills of 7 MP resolution (3104 x 3228) but more on Superior auto a little later. Naturally, the Sony Xperia Z Ultra camera offers all kinds of features, including face detection, smile shutter, geo-tagging, touch capture and HDR mode. There's also the home-baked quick launch mode, which lets you select what the camera shortcut on the lockscreen does. You can go for simply launching the camera in either still or movie mode, or you can set it to immediately snap a photo/start capturing video. This might come in handy for those occasions when you are worried that you might miss a shot, but is also useful for when you don't want to waste your battery keeping the camera interface constantly going (it's a real battery hog). 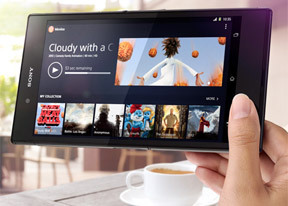 There are all kinds of shooting modes on the Sony Xperia Z Ultra aside from the Superior auto and Normal. You get Burst, which can capture practically unlimited number of shots, but gives you three shooting modes - High ( up to 1280 x 720 resolution), Mid (3104 x 1746) and Low (1920 x 1080). Picture effect does what's advertised and gives you different filters and effects to work with. Finally, there's Sweep Panorama, which captures a landscape panorama image, and scene selection. The good news is the Superior auto mode also tells you what it guessed so you can easily intervene if it gets it wrong. Our experience so far shows it gets things right almost every time, so unless you are a photography enthusiast or you just need to have that extra megapixel of resolution back, you're probably better off sticking to Superior auto. We've compiled a bunch of samples from the Sony Xperia Z Ultra camera for your viewing pleasure. The first two batches are taken in normal mode, read 8 MP, while the third is captured via the Superior auto mode in 7 MP. In the samples below you'll notice that the Sony Xperia Z Ultra doesn't really handle colors well. Notice how the flowers are blown out to an extreme and detail is all but lost to a uniform solid color. The Xperia Z Ultra sometimes chokes to find the correct light balance, especially in cloudy conditions. While it went for a colder look a bunch of times, it frequently turned to a warmer setting without any major change in the light, so white balance is a bit unpredictable. Otherwise, the resolved detail in the photos is ok, but it is behind the best in class. There is a lot of noise visible in the images even in good light and Sony has prepped the camera processing to combat it too aggressively, resulting in smeared fine detail. There's some corner softness in the images, too, most apparent in our chart samples in the photo quality comparison tool. This is probably due to an issue with the lens, which might as well be a unit-specific issue. Also if you notice the lines of the buildings you'll notice some over-sharpening and the resulting halos. Contrast is good, giving the photos a lively look and colors are accurate if a little punchy but that's how many people prefer them. We didn't notice a lot of change in the detail levels when comparing Normal and Superior auto images but the white balance is certainly different, which gives the whole image a different look. In any case we slightly prefer the Normal mode's take on scenes as it provides more accurate balance. The Sony Xperia Z Ultra handles macros decently. It can get as close as any other smartphone and outputs nice levels of detail. The background gets nicely blurred but, again, images exhibit a lot of noise. We've enrolled the Sony Xperia Z Ultra into our Photo quality comparison vault where you can pit it against pretty much every other phone we've tested. Our competitor choices involve the Samsung Galaxy Mega 6.3 and the Samsung Galaxy S4 Active - both sporting 8 MP snappers. The tool's page will give you information on what to look out for. The Sony Xperia Z Ultra is capable of capturing 1080p video footage at 30fps and that's about it. With the inclusion of the powerful Snapdragon 800 SoC we would've liked to see 1080p video recording at 60 fps or even 4K but we guess the sensor used is either an older generation (in order to fit in the tight body) or Sony just couldn't be bothered. The device has also lost the HDR video capture, which was a gimmick enough on the Xperia Z and we can't complain too much about its loss. You can also capture stills while recording video but they are nothing more than a snapshot of the currently recorded video at 1 MP each and you can just forget about using the feature. The camcorder app is practically the same as the camera one, it only displays more video-centered settings. You can include digital video stabilization, which crops a little from the field of view, set a timer and fiddle with settings like exposure, metering, focus mode, etc. Other than these nitpicks, the Sony Xperia Z Ultra is a capable camcorder substitute. It captures 1080p videos at around 29 frames per second with a good bitrate of 18 Mbps with stereo sound recording of 132 Kbps bitrate and 48 kHz audio sampling rate. Detail-wise the videos that come out of the Xperia Z Ultra are very good. The action is smooth and the focusing is quick to keep up. The field of view is also wide enough so that you don't need to back up from your intended target. Here's a video taken with the Xperia Z Ultra. You can also find a 1080p video sample (56.2 MB @29 fps) taken straight off the Xperia Z Ultra here. The Sony Xperia Z Ultra is the latest to join our Video quality comparison tool and it will face-off against the 1080p-capable Galaxy S4 and optically-stabilized HTC One.